Beach-day hopes are dashed by a storm, but in slumber a mighty ship outruns the tempest; and in the morning, the protagonist finds the promise of a new day. For a week, a child’s excitement for a beach day has grown. But a teacher’s storm warning and the growing dark sky threaten disappointment. Then comes the rain, beating down with a howling wind, sending the child under covers. As sleep and dreams mingle, the protagonist casts off on a Miyazaki-esque flying ship, with propellers strong enough to “drive the storm away.” Through darkness the adventurer travels, until reaching clear skies. Upon awakening, the child finds a bright, blue sky. 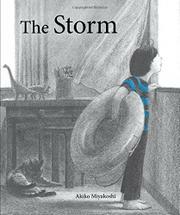 Miyakoshi’s black-and-white charcoal illustrations, with oh-so-judicious spots of blue, take readers on an emotional journey filled with anticipation, discontent, excitement, and hope. Her varied compositions and sophisticated technique of rendering cloud effects and light in black and white are compelling. As the protagonist climbs a rope ladder, readers will feel the wind in their own hair and a boldness of spirit, and as the sun bursts forth on a spread reminiscent of those of Chris Van Allsburg, a sense of optimism will pervade. Sparse, simple text allows the evocative artwork to shine.